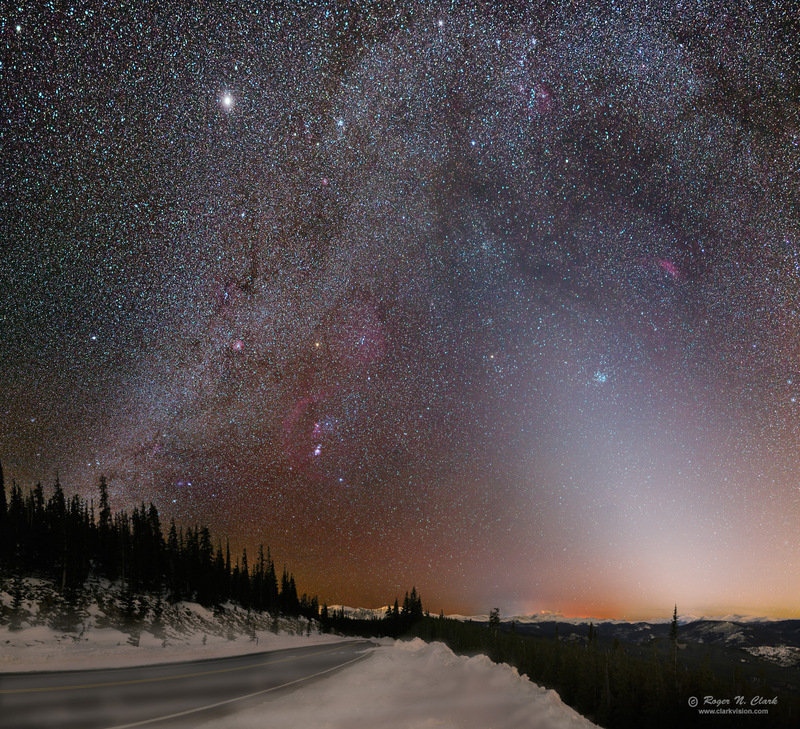 High in the Colorado Rockies on a wintery evening, the night sky with Orion and the Zodiacal light shines over a lonely wind swept road at 10,000 feet. The road is Colorado Highway 103 and in the distance above the road is 14,000 foot Mount Evans. Above Mt Evans shines the constellation Orion. The bright band of light from the lower left to above center is the Milky Way galaxy and the bluish-white band from lower right to upper center is the Zodiacal light--dust in our Solar System scattered by sunlight. In the band of the Zodiacal light is the star cluster M45, the Pleiades. To the upper right of the Pleiades is the red California nebula. The bright "star" at the upper left is the planet Jupiter. Below the left star in Orion's belt is the Horsehead nebula, and the red arc around the Orion's belt and sword is Barnard's Loop. Many star clusters and nebulae show in this image. Note the many dark lanes in the Milky Way. These are very long filaments of dark dust. Higher resolution images can be viewed below. This is a mosaic of 32 images. As I started the mosaic, wind started, and continued to get stronger as I proceeded to make the mosaic, which took 39 minutes. Near the end of the sequence, the wind became so strong, I estimated 50 miles per hour, that I was concerned that my lens would be sand-blasted but blowing ice grains. When I took my gloves off to make adjustments, the flying ice grains stung like sand in a sand storm. Indeed, the lens was covered in a layer of dust when I was done, but did not damage the coatings. The temperature (without any wind chill factor) was 18 degrees F (-8 C). The wind chill made it seem like -6 F.
The light in this image is what was at the scene. I did not add any light to the foreground. The night sky shows the varying colors from stars, nebulae, and the Milky Way galaxy. Adding to the scene is the bluish-white light from the Zodiacal Light, which appears very bright around the spring equinox in the northern hemisphere. Adding to the extraterrestrial light is light from airglow in the Earth's atmosphere, mostly a red glow from oxygen molecules fluorescing from excitation by solar ultraviolet light during the day. Also apparent is a blue and orange glow on the horizon just right of center. The orange glow is light from Silverthorne, Dillon, and Frisco, Colorado. The blue light is from mercury vapor lights illuminating the ski slopes at Breckenridge, Colorado. The summit of Mt Evans is illuminated by light from the Denver metro area. The red/orange in the sky also includes some light pollution. All that light from the sky illuminates the landscape. The red nebulae is emission from hydrogen atoms (H-alpha and H-beta). The bluish light from the Zodiacal light is due to fine particles, similar to scattered sunlight in the Earth's atmosphere making our daytime sky blue. The particles causing the Zodiacal light are larger, thus less blue, but further from the sun (higher in the image), the particles are smaller, and the light is bluer. For more on natural color in the night sky see Parts 2a, 2b, 2c and 2d on Color of the Night Sky and proper post processing to show those colors. The image above image is 1/12th resolution. A 1/9 resolution can be viewed HERE (1.3 MBytes, 1400 pixels wide). A 1/3 resolution of the region around Orion's belt and sword is shown in Figure 1. Figure 1. 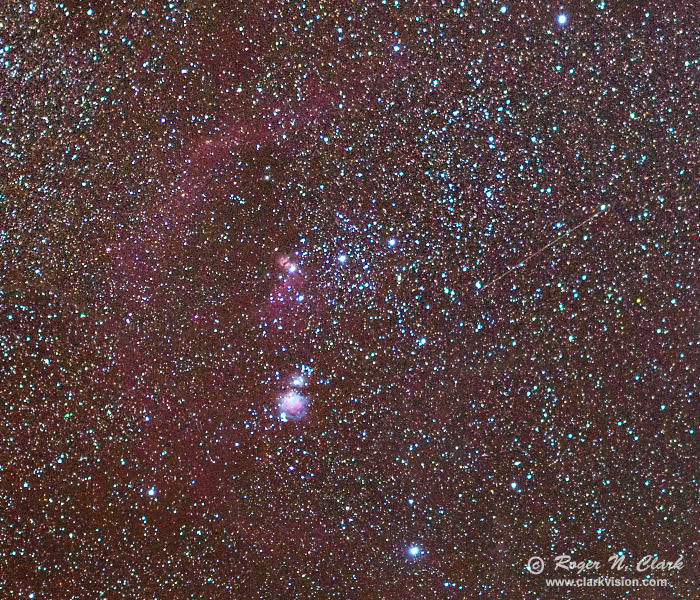 A 1/3 resolution crop of the central part of the constellation of Orion. The three bright stars at the center is Orion's belt. The red nebula below the left-most star has a small dark notch: that is the horsehead nebula. A larger image, made with a 200 mmm lens, is HERE. Below the belt of Orion is the three unaided-eye stars that make up the sword of Orion. The center "star" is the Great Orion nebula, M42, a beautiful sight in any telescope. The link to the image made with the 200 mm lens also shows the reddish orange background nebula in this region, and that light contributes to the color of the night sky (it is not blue as commonly perceived). Technical. Canon 6D 20-megapixel digital camera, Sigma 35 mm f/1.4 lens at f/1.4. Thirty two 30-second exposures at ISO 1600 were made for the mosaic. On the sky, the camera tracked the stars using an Astrotrac, then images of the land were made with no tracking. The sky mosaic includes 17 images and the land 15 images. Final image is 12,600 pixels wide by 11488 pixels tall covering an angular area of about 132 x 120 degrees. The image was obtained on March 19, 2014, a little over 2 hours after sunset. No dark frame subtraction, and no flat field were used. The Canon 6D has the very low pattern noise, and on-sensor dark current suppression, so there is no need to do dark frames. Modern raw converters correct for hot pixels and, with lens profiles, correct for light fall-off, so there is no need for flat field corrections. Processing was done with 16-bits/channel.